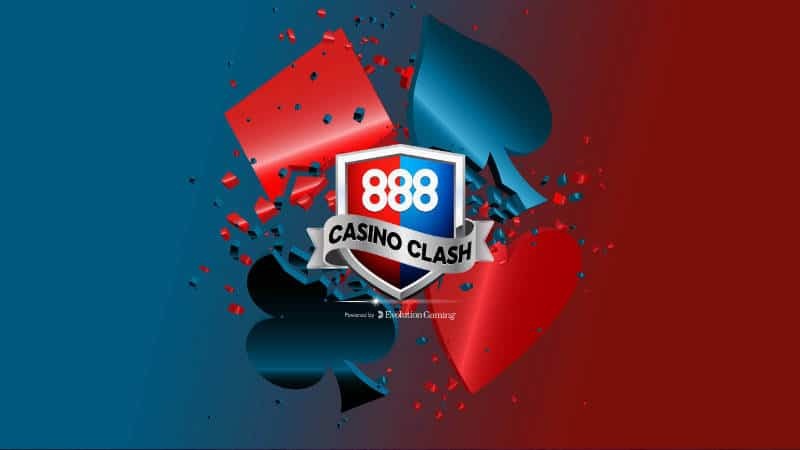 888 Casino Crush is an online card played with a live dealer. It’s a one player game, where the objective is to predict which one of two playing positions will be dealt the higher value playing card. The high card wins. The game has been created by Evolution Gaming and is normally marketed as Football Studio or Top Card. This version, Casino Crush, is exclusive to 888 Casino. It’s essentially exactly that same game, just skinned and presented differently. Casino Crush is similar to Dragon Tiger, but with 2 major differences. The first is, Ace is High in Casino Crush and Low in Dragon Tiger. Dragon Tiger pays suited pairs at 50:1, while casino crush only pays 11:1. Other than that both games are identical in the way they are played. The dealer has a dealing shoe filled with 8 decks of shuffled cards. 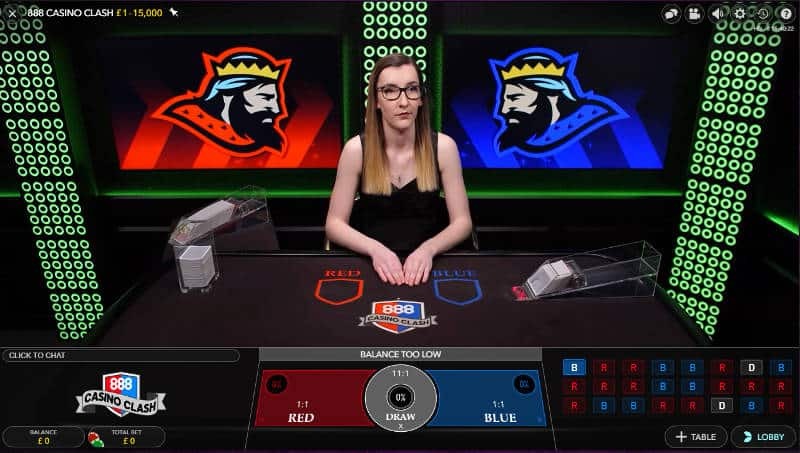 The player places a bet on either the Red or Blue and/or Tie Positions on the table. The dealer deals two cards, one to the Red position and one to the Blue. The winning hand is the one that has a higher card value than the other hand. This pays even money 1:1. In the event of a tie, 50% of the losing bet is returned to the player. If you’ve bet on a Tie you’ll be paid 11:1. My strategy is quite simple. I bet on runs. A run can either be the same position or a bet on alternate positions. I make my decision what to do based on the past history of the shoe. A “Roadmap” is displayed that provides details of the past history of the hands. When a new shoe is introduced you’ll see a “CC” in the roadmap. B is for a Blue Win. D is for a draw or Tie. If the Roadmap shows a choppy shoe, i.e. one alternating between R & B i’ll follow that pattern. If the shoe has lots of runs I’ll follow that pattern. The key is to start betting at the beginning of a run. I bet just one multiple. But I know others that double the bet after each win. If you lose after two hands you’re back to square one. The idea is to bail out when you’re in profit or reduce your bet before a losing hand arrives. I much prefer betting this way as it gives me a focus, rather than just a scatter gun approach. Either way you stand as much chance of losing as you do winning, so always gamble responsibly. Here’s a video of me playing and explaining Casino Crush. Note: I left with a small profit by following my betting strategy. If you fancy a go.